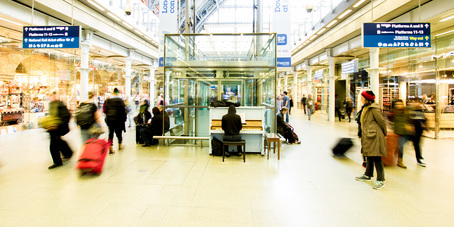 The original Street Pianos at St Pancras International Station were placed there after they were donated to the railway station at the end of Play Me, I’m Your – London 2012. The pianos currently at the station are regularly repaired and tuned courtesy of the station management team at St Pancras International Station. British artist Luke Jerram‘s Play Me, I’m Yours Street Piano project has now become part of contemporary culture with street pianos popping up in railway stations, shopping malls and airports internationally, as well as the 75 official Play Me, I’m Yours presentations that have seen over 1,850 street pianos installed in cities across the globe since the project started in 2008. Daphne en route from Oxenholme to Margate! 12th September 2018, No. 1 on my bucket list ticked off!! My Son, playing in St. Pancras on our first time to the U.K. I'll never forget our experience. Taken in 2015, with a slow shutter to capture the movement of the public racing by, while the unknown pianist plays to a few static listeners. If used, please credit Phil Croucher Photography, thanks! Played the piano in St. Pancras international station. BTW I was just pedestrian today. 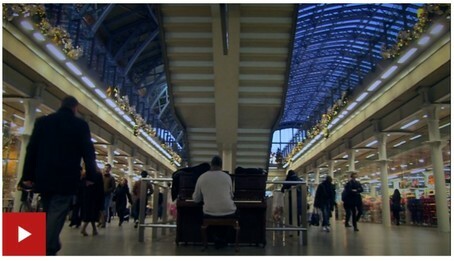 BBC News spent a day at St Pancras station, where there are two public pianos. Will you be my Tinderella? Canon in D? how about Improvisation in D?